It's Saturday morning, and I have nowhere to be. But when my alarm blares at 5:30 a.m., I dutifully hit the shower. By the time my son is wailing from his crib at 7 a.m., I am doused in primer, foundation, concealer, two types of highlighter, a smoky eye and a red vampy lip. I'm wearing a wavy blowout ... and sweats. In four months, I've tested nearly 500 beauty products for our annual TotalBeauty Awards. 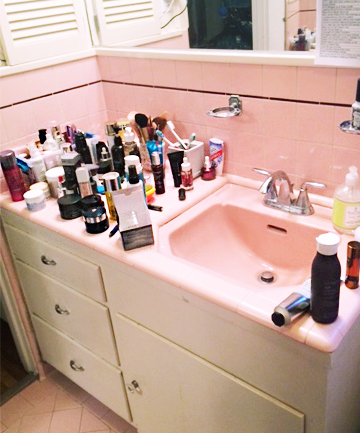 I am fast approaching beauty product burnout -- and much in need of a detox. That's when a product called Mother Dirt AO+ Mist crosses my desk that promises to keep you clean and improve skin without the need for soap, beauty products or even showering. It's a probiotic spray that replenishes the good bacteria that once lived happily on our skin before soap and other modern hygiene products wiped it out. Just as good bacteria are essential for a healthy gut, they're the key to a better complexion, goes the thinking. These bacteria gobble up sweat and help skin self-regulate so you don't get greasy or stinky. Dry patches, acne and general skin freak-outs become a thing of the past. Some even say it's the secret to more youthful skin. Consider this no-soap regimen the Paleo diet of the beauty world -- a back-to-basics approach to hygiene and a clearer complexion. But would it work -- and at what cost? To find out, I decided to turn in my towel, soap, deodorant and every other beauty product I own for an entire month.